The best part about Christmas time are the traditions. Traditions are what made Christmas so exciting for me. Every year I could look forward to night spend looking at Christmas lights, decorating sugar cookies, Christmas caroling, and of course the ritual of Christmas morning getting up together and going downstairs to see all our goodies from Santa! I always thought my mom did a great job of carrying on these traditions, but one thing I took for granted is how much she baked during this season! She did so much more than just baking sugar cookies…she baked cinnamon rolls, fruit cakes, all kinds of breads, candy rings, the list goes on and on! And now I’m the mom so all that stuff is up to me! I have to get baking so my kids can have the same memories and traditions that I was so fond of. But I’d love to have them learn how and help me out. They love the eating and partaking part, but it’s so much more memorable to have them there with me (even though I admit it’s frustrating at times!) My list of baking is endless: sugar cookies, other kinds of cookies, donuts, cakes, breads. 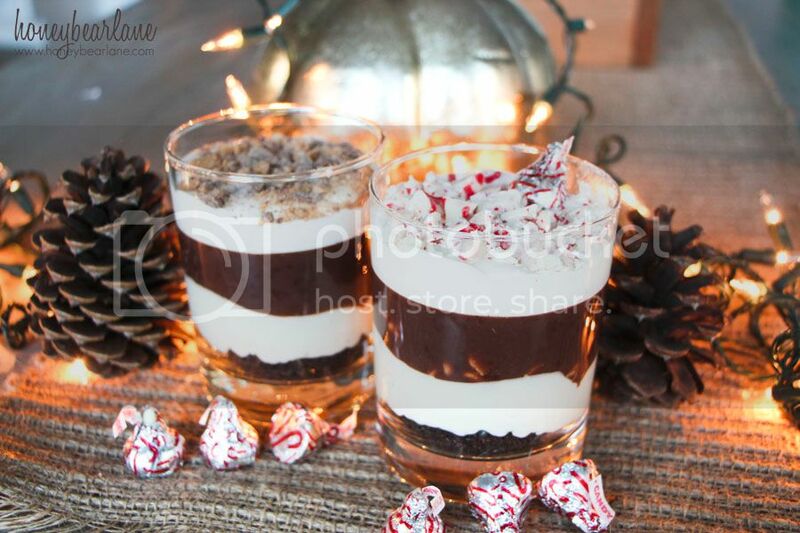 But sometimes it’s fun to think outside the box as well, so I decided to make mini chocolate lasagnas! What’s great about this recipe is that it can be served in individual portions and customized and basically makes a great party food. My recommendation after doing it this way would be to serve it in smaller cups or shot glasses. They should be clear so you can see all the pretty layers, but I made mine in these larger cups which was a big too large of a serving for one person, I think. But it was still yummy! And I loved how easy it was to change it up. 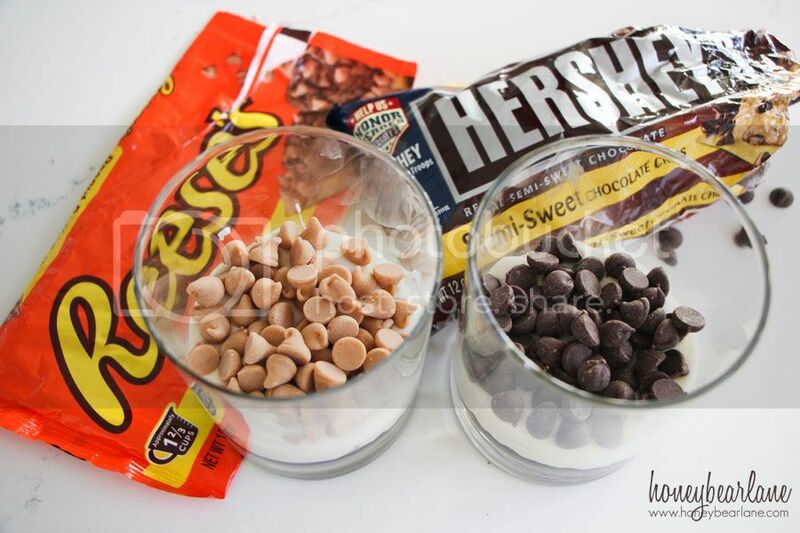 To make mini chocolate lasagnas, you have four basic layers and you can change it up with various different candies and toppings in between layers. I crumbled up a chocolate cookie into fine crumbs for the bottom. You could also change this into a variety of cookies–a snickerdoodle would be yummy! Just make sure the flavors go together. If you wanted to do a peppermint/candy cane topping, you could consider putting it at the bottom also or doing a graham cracker crust or maybe even a thin mint crust. Yum! Before I add the pudding, I like to throw in some sort of chip here. I varied these two between Reese’s peanut butter chips and semi-sweet chocolate chips. You could do mint chips, peppermint chips, butterscotch, dark chocolate…so many possibilities. Then you mix up a package of Instant chocolate pudding (make sure it’s instant and not Cook ‘n’ Serve!) and pour it on top of the cream cheese layer, about the same thickness. Put these in the fridge for a little while to set. When they’ve chilled in the fridge for a least 10 minutes, you can take some whipping cream and whip it up. You could probably also cheat and use Cool Whip again but I love the taste of homemade whipped cream and it’s super easy to make. Just pour your whipping cream into the mixer, add about 1/3 cup of sugar and 1 tsp vanilla and whip it on high for awhile, at least 5 minutes. It will eventually thicken up to a more stiff consistency. After you’ve topped off each glass with the whipping cream, it’s time to add the pretty toppings! I varied between Heath Milk Chocolate Toffee Bits on the peanut butter chip cup and chopped Hershey’s Kisses Candy Cane Mint candy on the chocolate chip cup. It’s so pretty! 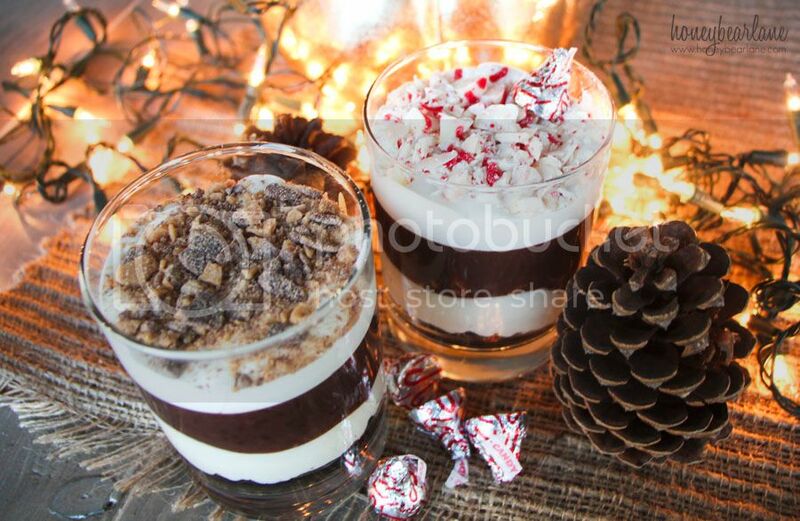 You can go even further and slide a cute spoon on each cup or a candy cane or mint leaf or something festive. This is such a great party dessert and it’s already individually portioned so you don’t have to spend precious party time dishing up dessert! There are endless combinations to this basic mini chocolate lasagna recipe. What would you add? 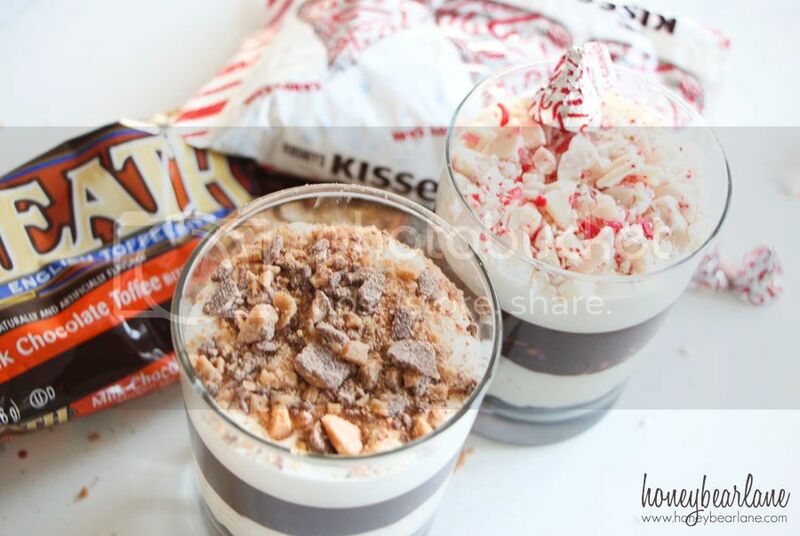 I personally love everything provided by The Hershey Company since they are one of my favorite brands for cooking– all the extras I added to these were Hershey’s! Basically I have to have a fully stocked pantry when the holidays come if I want to carry on the traditions of baking with my kids. You need to have every kind of chocolate and flour and butter and sugar. And lots of it! And then you have your kids eat it and make neighbor goody plates and take them to them along with some Christmas caroling. So many fun and happy memories can be created when you start baking.